Provo (the island and the city) is booming. Everywhere you can see, new houses, condos and other buildings rise up out of nowhere. It doesn’t make the land look pretty, but it creates a lot of work for the locals. The town, about four miles inland from the anchorage, is very spread out with US-like roads and malls along it. The only differences are the left hand traffic and many roundabouts. Even payment is dollars! When we hitched a ride to immigration a few days after our arrival, we were told to come back later, two days before our “visas” expired. We were happy to just relax, sit on the boat and make some walks for a few days, especially after the long and tiring trips to get here. One evening we hiked to the top of a hill for a nice view over Chalk Sound with its turquoise water, Sapodilla Bay with its four sailboats, and the not so attractive industrial harbour. Some of the rocks near our feet had the names of previous adventurers (ship wreckers) engraved in them. The day after Irie arrived in the Turks and Caicos, we saw a familiar boat show up… Finally, we met up with our friends Cindy and Gray again. It was great seeing them and we had a lot to catch up on after the necessary rest. On Thursday night, we all went to a nice BBQ, organized by the friendly folks of Southside Marina. They also have a cruiser’s net on channel 18 every morning at 7:30. On Friday, Cindy and Gray rented a car to run some errands. We joined them for part of the day. All of us drove to immigration in town, to receive our extension. That didn’t prove to be easy and simple at all. After filling out forms and waiting for an hour, we discovered that we each had to pay a fee of $50 to stay any longer. Nobody had told us anything about an extra fee! We asked the immigration officer for an explanation and said it wasn’t fair that we only got a week, when people arriving on a plane receive a month to visit the country. We felt in a bind now, because we either had to pay the $100, on top of the $75 for the cruising permit we just obtained, or we had to leave the country in two days, an impossible feat knowing that we need the weather on our side. 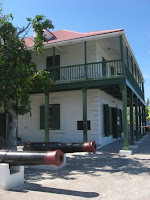 We discussed our options for a bit, while showing total disappointment with the system and the hospitality of the Turks and Caicos Islands (TCI). Now, we were ready to explore the islands, and we soon found out why most people don’t even bother… We left swelly Sapodilla Bay and crowded Provo by early morning, to make the long haul over the Caicos Banks to Fish Cays. We motored the whole 50 miles, dodging black spots and admiring the beautiful clear waters. Once anchored off Big Fish Cay, it felt as if we were anchored in the ocean. The swell was huge. We couldn’t even walk around the boat without bumping into everything and I was continuously seasick. After a lot of difficulty, we managed to load the dogs, in live jackets, into the hopping dinghy. The waves then threw aforementioned device and passengers onto the beach, where all of us stayed as long as possible. 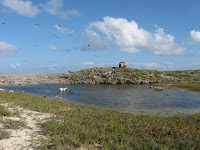 The island itself was quite interesting with its barren, rocky appearance, mucky, lukewarm, fresh water pond (the dogs loved it), and extensive bird colonies. A big osprey was sitting on his huge nest, made on top of the highest rock. After rocking and swaying all night, Irie understandably left first thing in the morning. 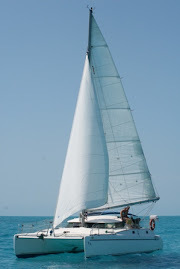 We managed to sail the last stretch to South Caicos. In dare need of water, our only option there, was to tie up at a concrete dock (ouch! ), and wait until the water truck showed up. In the meantime, we strolled around what was called town. It had the feel of a sleepy fishing village. Nothing much was happening and even less was there to see. Even though, we had arrived around 11am at which point we ordered the water, it took the truck until 5pm to show up and deliver our 65 gallons. We had grown antsy by then, since the good light was disappearing, making it hard to find a spot to anchor and we wanted to leave the damaging dock, before all our lines were chafed through. We took our chances and left from the moment our tank was full. The anchorage next to Long Cay (about half a mile from town) was pretty nice with clear water, but quite some current. The east winds created a lot of wind waves, but nothing too uncomfortable. 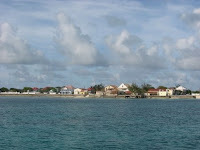 The snorkelling on the nearby reefs was very good and we enjoyed some peaceful days in the company of Cindy’s Island. The only problem for us was the lack of a good beach to take the dogs to shore. The areas where you could land a dinghy, were totally stacked with sharp conch shells. We managed to clear a little bit of a path through the pointy mess for the time being. No fun time for the dogs, though, and lots of mosquitoes. From South Caicos, we went on to Grand Turk, crossing 22 miles of bumpy ocean. My seasickness played parts again. Mark and I decided to sail the stretch tacking back and forth. What would have taken five hours under motor, now took almost 8 hours. But, we saved some expensive diesel and we (Mark) brushed up our sailing skills. We also got company from a pod of little dolphins, jumping along the boat. On the lookout for dark spots on the "lower deck" since it was rough out.